1. Tbe number "foUr" pervades tbe seder. and four promises of redemption. 2. There were originally only three questions. 3. Tbe Ballad of tbe Foar Sons is biblically based. answers to the queries were formulated in later centuries. all in our own CCAR Haggadah. ture. Some Haggadah omit Moses altogether. Why? place is unknown for the same bask reason. 5. Tbe Cap of Elijah originally resolved a rabbinic dispute. sion. Hence the name, Elijah's Cup. 6. Tbe afikoman a is used as a good luck charm during the Middle Ages. the bones to prepare the house. covered me with those rags. drunk, head of the "Samochova"
family, but I never see their faces. ing for his lost wife and son. Yentl and her two children. my sister Reva and I.
rags of the Passover dishes? million men, women and children. ror will never be forgotten. ceremony at 8 p.m. on May 4.
those who died," Orlan said. who now awaits trial in Prance. find meaning in human existence. year in the Jewish calendar on the 27th of Nissan. military installations, and in community-wide programs. turn right (south) on 14th Avenue. Sunday, May 4 2 p.m.
Country Club 400 Entrada Street, Hollywood. Monday, May 5 7:30 p.m.
Day School, 5801 Parker Avenue, West Palm Beach. Monday, May 5 8 p.m.
9353 S.W. 152nd Avenue, Miami. Tuesday, May 6 9 a.m.
the Commission Chambers, 2nd floor. Metro-Dade Center, 111 N.W. Tuesday, May 6 5 p.m.
7205 Royal Palm Blvd., Margate. Tuesday, May 6 7 p.m.
Tuesday, May 6 8 p.m.
gregation Bet Breira, 9400 S.W. 87th Avenue. Miami. Wednesday, May 7 t a.m.-3 p.m.
Thursday, May 8 9:30 a.m.-5 p.m.
tion, call Rositta at 940-5690. Saoond Oaaa Poataga paid at HaHandala. Fla.
Out ot Town Upon Raquaat. The Despair of World Silence: Personal and Government Responses. Antecendents of the Holocaust: Their Role of the Christian Church. 10:00 a.m.-12 p.m./2 p.m.4 p.m.
been principally shaped by an event that took place before he was born. and Biscayne Blvd., Academic I Building, Room 264.
wack, Ph.D., Dir. of Programs, Holocaust Memorial Center. Rositta E.
they have targeted," she said. signal throughout the entire world. ,,e?-rffin9 !He ?orld*s Je*s "our elder brothers." you reaffirm the letter and spirit of Vatican II. will not have to wait aany .ore year..
the air. No one was hasseled, or if they were it wasn't obvious. Wow! My first thought was "What's wrong with my family?" world of television. Their "perfect" family is a fantasy of sorts. really is, and what it's purpose is in the actuality. possibly very different needs. Differences often cause dissention. equipped for the real world. for perfection, but we are looking for balance. and help to develop it," he said. in Hos Hasharon," he added. 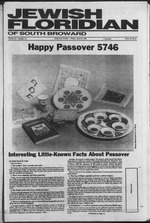 on Wednesday, May 7, at St.
home ritual of any Jewish holiday. their diety for an abundant crop. ment in the Exodus account. popular name for the holiday? Israel dates back to 700-600 BCE. Young Israel of Hollywood to T.Y. WE FEEL LIKE PART OF THE FAMHY. person for dinner and dancing. qualified counselors to help you. or 749-1505 in Fort Lauderdale. Ted Newman and Michael Orlove. Mix eggs, orlt packet G Washington s and pepper Gradually add matzah meat. to say weVe sold out for this Summer. apts available for Summer rentals. troduction by Eugene B. Borowitz. N6 5SF. (Distributed in the U.S.
York, N.Y. 1003). 1985. 5t pages. year the holiday falls in late April. for each one of us exclusively. Talmudic times at the very latest. & Aerobics and Arts A Crafts Oasses-And Much More"
'diet (\ NTER OtX Can** appro mil mull | avaaabr*. OMcM Counaator or consuRstton. the Nazi death camps. That is all. about the provenance of the texts. nontext is the most useful one. * right next to the Magic Kingdom. tennis courts, fitness trails and helicopter rides. to accommodate your conventions and groups. service and reputation for quality. l.'sv than St-" i"i pei person pe'i >!. '\ in ludinp meals. KMr good through < 01 M.
Brown, BEF chairman, second from right. best known songs of the holiday. Muppets. from which they derive. with it and through it? those wanderers must have led. called "Cupid of Capitol Hill,"
were not part of the early seder. the Prague Haggadah of 1590.
teachings, for Jews of all ages. modern Jews, to "tell the story"
with his beloved wife Avital and friends. and a desire to live in Israel. respect the yearnings and traditions of an ancient people. may they say it in joy. next year, we are free. lead ns upright to our Land! In 1926, there were 1,000 synagogues in the USSR; today, 60.
are widely used to spread "anti-Zionist" propaganda. been rescinded. Some have been waiting twenty years or more. emigration or raising Jewish consciousness among other Jews. treason. They have been jailed, exiled to Siberia, brutally treated. But they persist. They are our inspiration. REDUCING THIS PRICE TO A LOW $63.00. April 28, services will be at 8 a.m.
ing services at 8 p.m.
evening services at 8 p.m.
May 2, at 8 p.m.
May 3, at 8:45 a.m.
on Thursday morning at 8:45 a.m.
take place during the service. ner will be held on Sunday, May 4.
given service throughout the year. Zinn Chapel with Rabbi Richard J.
morning services are at 8:45 a.m.
in the main santuary at 8:45 a.m.
vices will take place at 10 a.m.
at 8 p.m. in the Haber Karp Hall. the temple office at 920-1577.
service, Friday, April 25, 9 a.m.
on Saturday, April 26, 9 a.m.
the Jack Shapiro Chapel, 1400 N.
46 Ave., at 7:30.a.m. and 5 p.m.
on Hollywood Blvd. at 10 a.m.
a full fledged facility in that area. formers, will be in attendance. nyan so that Kaddish may be said. relate it to the current events. well as external Jewish world. mitments and bonds to our people. Zion and the Jewish people. on ON 2 Wer bottles of MJP. son, tax and parking included. stitute of Science in Israel. Schaefer and his wife, Sylvia. rights, ecology, and world hunger. And Happiness During This Passover Holiday Season. seeking endowments in the U.S.
skill Mountains of New York. technical schools in 19 countries. Yeemg Israel af Hollywaad 8291 Stirling Road; 966-7877, Rabbi Edward Dark. morning, 9 o'clock. Religious school: Kindergarten 8. School: Nursery, Bar Mitavah, Judaica High School. Skidell. Sabbath service*. 8:15 p.m. Religious school: Pre-kindergartefi-8. the S. Florida Raquetball Club. welcoming people irom an wants Point Senior Center. their academic or career plans. asked to contact: In the U.S.
of directors of The Starting Place. continued delivery of its services. sidered eligible for financial aid. held May 1-2 from 9 a.m.-4:30 pm. Area Agency on Aging, 485-6370. Monday, May S 7:30 p.m.
gregation Bet Breira, 9400 S.W. 87th Avenue, Miami. PutXIstved Weekly January throuan March Bi Weekly April through August. MOLL YWOOOFOHT LAUOEROALE OFFICE. 8356 W Oakland Park Blvd . Member JT A teven Art*, WNt. NEA. AJPA. and FPA. S..eSwf-n9 1^ wrld'S Je" -s "our elder brothers."